"a Belgian wit ale spiced with orange peel, chamomile and coriander". I recently had the opportunity to try this seasonal brew from Great Lakes Brewing Company (Cleveland, OH) at an all Ohio craft beer tasting. While I was not immediately blown away by this craft beer, after the first few initial sips it did start to grow on me. Here are my interpretations of this beer. Appearance-This beer pours to a cloudy pale yellow hue with a slight creamy head and some lacing. Smell-The first thing I smelled from this beer was a light soapy scent. A second sniff yielded a faint but pleasant aroma of citrus and spice. Taste-The initial flavor of this ale struck me as perfumey and a little off putting. Subsequent sips yielded a zesty, somewhat spicy taste that grew on me as I drank my sample. Mouthfeel-The combination of mild carbonation and zesty bite proved refreshing once I got past the initial "soapiness". Very little aftertaste to interfere with the taste of my food. Overall Impression-I was not impressed with the first scent or taste offered from this brew, but as I got deeper into my sample, a refreshing spiciness took hold of my tastebuds. it is not a beer I would choose as my daily drink, but I can see myself grabbing this one again for a special treat. This brew should pair well with seafood, poultry and salads. 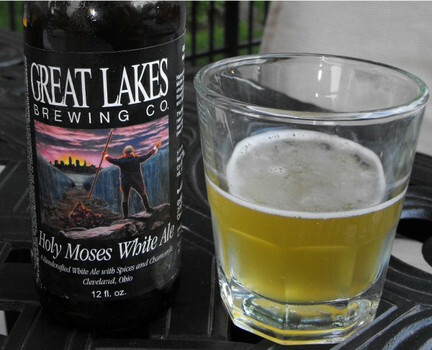 Holy Moses White Ale is available April-July and can be purchased in six or twelve packs and on draft. This brew has won several awards, including a bronze (2006), 2 silver (1995 and 2001) and a gold (1996) at the World Beer Championships. You can purchase Great Lakes beers locally at Heather's Coffee and Cafe (Springboro), United Dairy Farmers, Cub Foods, Springboro IGA, Kroger, Walmart, Milano's and Max and Erma's. For more information about Holy Moses White Ale-and the other craft brews from Great Lakes Brewing, please visit their website, Facebook page or Twitter.